In Photo from left to right: front: HFN Commercial Marketing Representative Joy Madriaga, presents a check from “Fuel Up. Do Good.” Community Grant. HIAC Board members Jan Nakahara and Judy Ah Chin, HIAC Health Services Director/GHW Program Director Maile Young, HIAC Executive Director Paula Uusitalo. Back: HFN General Manager Mark Leong, Hawaii Petroleum, Inc. President Kimo Haynes, HIAC Board President Jeanne Beers. 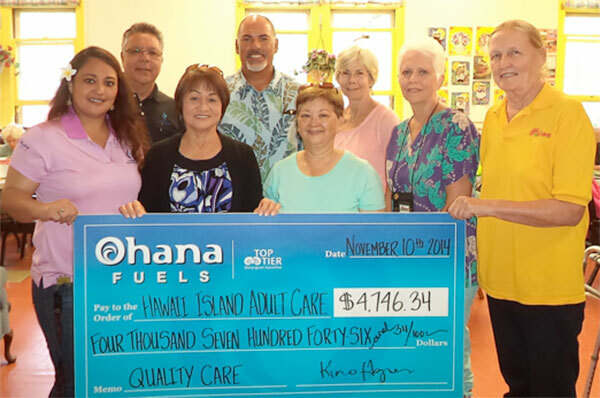 A firm believer in helping our local community thrive, Ohana Fuels gifts Hawaii Island Adult Care, Inc. $4,746.34. 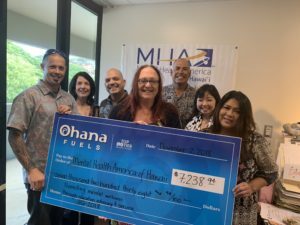 Contributions provided by Ohana Fuels will be used to support HIAC’s Caregiver Connection program, which supports community/family caregivers who care for elder and challenged adult loved ones. Contributions like these from Ohana Fuels, support families to be able to continue taking care of their loved ones at home. “The mission of our Giving Program is to help meet the needs of the communities we serve by supporting nonprofit organizations that improve overall quality of life. 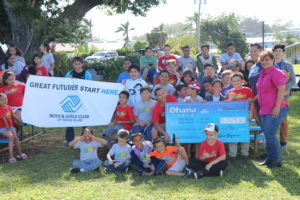 Ohana Fuels proudly sponsors programs that enhance the vitality of our neighborhoods, celebrate our community’s success, and support local charities”, said Kimo Haynes, President of Hawaii Petroleum Inc.
We greatly appreciate the generosity of President Kimo Haynes and his HFN Ohana for their contributions and support. 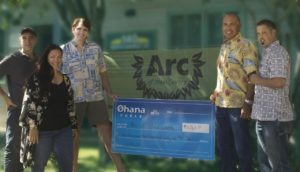 In a testament of corporate and non-profit sectors partnering together HFN Ohana is able to help the most vulnerable individuals and families in our community. Hawaii Island Adult Care, Inc. is a non-profit agency serving kupuna and challenged adults and their families since 1976. Programs include the Hilo and Honomu Adult Day Centers and Caregiver Connection with Support Group and Caregiver Respite Days. This contribution will directly support our Caregiver Respite Days for one year. It provides an opportunity for family caregivers from the community at large, time to relax, get massages, engage with other caregivers and learn skills needed to care for their loved ones. Additionally it will provide tuition assistance for low income participants attending the day care program. Ohana Fuels has four locations on Maui and four stations on Hawaii Island. Ohana Fuels gasoline has been certified as TOP TIER™ to meet the premier standard of gasoline for optimum performance and fuel efficiency recognized by six of the world’s top automakers, BMW, General Motors, Honda, Toyota, Volkswagen and Audi. TOP TIER™ additives help clean your engine; optimize fuel economy; eliminate hesitation, stalling, and rough idling; restore optimum performance; and reduce emissions.